When the summer strikes and most of the county is baking in the heat, book a summer treks in Uttarakhand to get away to the cooler climes of the mountains. There’s still snow in the mountains at this time, and you’ll have a wide range of snow treks to choose from. Book one of the summer treks in Uttarakhand, and you’ll be enjoying cool breezes, icy streams, and chilly nights under starry skies. Roopkund is a high-altitude lake that stays frozen for most of the year, thawing for just about one month. With the frequent rainstorms and snow here, this is one of the top summer treks in India to give you a break from the scorching sun. But what makes it a top trek in India at any time of the year is the human skeletons that surround the lake. The trail begins through verdant meadows and climbs to the barren heights, testing your stamina and endurance. This popular India summer trek is not advised for first-timers unless you’re very fit. This summer trek in Uttarakhand takes you through pine and oak forests with rhododendrons blooming all around. Grab the chance to camp beside the pristine Deoriatal Lake, and soak in the meadows of Chopta. While the Chopta trek is moderately easy, the real challenge is summiting the Chandrashila peak. Once at the top, pay homage in the highest Shiva temple of the world, Tunganath. A perfect option for beginners amongst the top summer treks in Uttarakhand, the end summit will test your endurance. An A-lister in the top summer treks of Uttarakhand, the Har Ki Dun trek is perfected with a trip to the Jaundhar glacier. The trek takes you through the Govind Wildlife Sanctuary, where the flora and fauna thrive during the summer months. While you will tread through lush green forests, this summer trek in Uttarakhand will also introduce you to the marvels of the Himalayan peaks. The highlight of this trip is an opportunity to trek on a mountain glacier. The Nagtibba trek in Uttarakhand begins just a few hours away from the towns of Dehradun and Mussoorie. You’ll be climbing to the top of a ridge peak, at an altitude of 3000 feet, on a fairly easy ascent. This trek offers spectacular views of surrounding peaks like Bandarpooch and Kedarkantha Peak at any time of the year, as well as charming views of Mussoorie in the distance. It’s a top summer trek in Uttarakhand because it takes you into the cool, upper reaches of the mountains, and into fields of wild mint, by the first day itself. The Kuari Pass trek is one of top summer treks in Uttarakhand, but is also popular at the end-of-the-year for those looking for a snowy challenge. This trek is moderately easy, except for the summit to Pangarchulla peak, which stands tall at 15,419 feet and puts your climbing muscles to the test. Your trail winds through green meadows and alpine forests, and past towering Himalayan peaks with enchanting panoramic views of Nanda Devi, the Chaukhamba Range, Mana peak, and Kamet peak. Rupin Pass is one of the top summer treks in Uttarakhand because it takes you deep into the mountains of Uttarakhand, and up to a windy pass at 15,000 feet. The trek involves long days of walking, and a steep ascent to Rupin Pass, so is not recommended for beginners. In this summer trek in Uttarakhand, you’ll be walking under blue skies, through thick blankets of snow, and enjoying the bracing cold weather. And there’s plenty of unusual sights to see: a village that perches dangerously on the edge of a cliff, waterfalls that are frozen in mid flow, and the icy Rupin river that is as blue as the sky above. 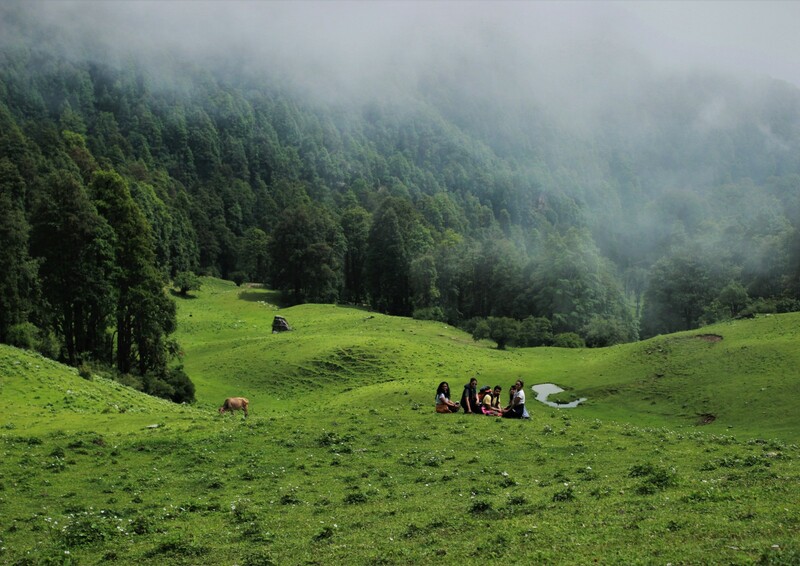 The Dayara Bugyal trek is considered to be one of the most beautiful summer treks in Uttarakhand, with visitors describing their experience as nothing short of a fairy tale. This easy trek takes you up to one of India’s most beautiful high-altitude meadows, surrounded by towering Himalayan peaks, and offers you the chance to camp in scenic locations at every stop. The trek is recommended for everyone i.e families with children, nature lovers and adventurers alike. The Dayara Bugyal trek begins at Barsu and takes you through old oak and pine forests, up to an altitude of more than 10,000 feet above sea level. You’ll visit the famous alpine lake near Barnala Bugyal, and you’ll see famous peaks like Kala Nag, Bandar Poonch, the Gangotri Massif I and II, among others. Brahmatal is a high altitude lake which is believed to be the place where Lord Brahma meditated millions of years ago. What is unique about this trek is that even though the trail doesn't climb to the highest of altitudes, it offers stupendous views of some high peaks. In fact it is the only trail in the country that offers views of summits over 7,000 meters at such close proximity, making it one of the easier summer treks in Uttarakhand. A small alpine lake and dense forests adds to the beauty and is a treat for shutterbugs. This is an easy to moderate trek and is suitable for fit beginners, but you can expect some low temperatures in winter, so do come prepared.